Short covering, also called ‘buying to cover,’ refers to the purchase of securitiesMarketable SecuritiesMarketable securities are unrestricted short-term financial instruments that are issued either for equity securities or for debt securities of a publicly listed company. The issuing company creates these instruments for the express purpose of raising funds to further finance business activities and expansion. borrowed by an investor to open and close a short position in the stock marketStock MarketThe stock market refers to public markets that exist for issuing, buying and selling stocks that trade on a stock exchange or over-the-counter. Stocks, also known as equities, represent fractional ownership in a company. The process is closely related to short selling. In fact, short covering is part of short selling, which involves the risky practice of borrowing price-declining stocks, trading, patiently wanting, buying back, and generating profitsNet Profit MarginNet profit margin is a formula used to calculate the percentage of profit a company produces from its total revenue. The profit margin ratio of each company differs by industry. Profit margin = Net income ⁄ Total revenue x 100. Net income is calculated by deducting all company expenses from its total revenue which is. In short covering, investors usually hold a belief that the price of the stockStockWhat is a stock? An individual who owns stock in a company is called a shareholder and is eligible to claim part of the company’s residual assets and earnings (should the company ever be dissolved). The terms "stock", "shares", and "equity" are used interchangeably. will fall. When they identify an opportunity when the prices are low, they borrow shares before share prices start to rise. They immediately dispose of them in the hope that the price of the stocks will fall. The practice is known as short positioning – opening short position and short closing position. Opportunity – An investor sees an opportunity that the price of a given stock in the market will soon fall. Opens short position – An investor borrows the shares of the company at the current price. Selling the stocks – Before the stock prices deteriorate to losses, the investor sells off the shares. Waiting period – The incubation period in which the investor must wait for the stock prices to drop before closing a short position. Closing a short position – Once the stocks drop below the speculated margin, the investor buys back the exact number of shares borrowed. Revenues – In the previous phase, there are two things happening in the market. One, the stock prices may fall as anticipated. The outcome will naturally lead to profits since the trader will exit the short position lower. The difference between the entry and exit is the profit. However, in the second option, the stock prices go high. As a result, the trader will make losses since the exit price will be higher than the entry price. Let’s take the example of Joe, a savvy equity traderEquity TraderAn equity trader is someone who participates in the buying and selling of company shares on the equity market. Similar to someone who would invest in the debt capital markets, an equity trader invests in the equity capital markets and exchanges their money for company stocks instead of bonds. Bank careers are high-paying. He’s been in the stock trade long enough to understand the way the stock market works. Recently, he’s been tracking the stock performance of XYZ Company. According to market gossips and his trading experience, the stocks of XYZ are likely to fall soon. Joe identifies this opportunity and he plans to go for it. He approaches his trade broker, who in return assists him to open a short position of 1,000 stocks, trading at $30. According to him, in the next two months, the stocks will go as low as $20, which is good business to him. Therefore, he acquires the rights to the shares, and he sells them at the current market price of $30. Then he waits to see what will happen in the stock market. With luck on his side, the price hits what he anticipated, $20 per share. So, he buys the 1,000 shares at a current price of $20 to close the short position. According to the math, Joe will generate a revenue of $10,000 ($30,000 – $20,000). He sold his borrowed stocks at $30,000 (1,000 shares x $30) and sold them at $20,000 (1,000 shares x $20,000). During short positioning, the price of a stock can rise or fall. If it falls, traders make profits, which is precisely what they want. However, if it increases, they are on the verge of making losses. The situation, by itself, creates chaos upon the stocks because traders are making more losses as the prices continue to move against them. As a result, they rush to opt out of the short position by selling off their shares. However, the more they sell their stocks, the more that stock gains value. The whole experience may seem as if it’s squeezing them out of the market. In short squeezing, the prices of the security rise significantly leading to a situation where traders rush to close their short positions due to the pressure of increasing stock prices. 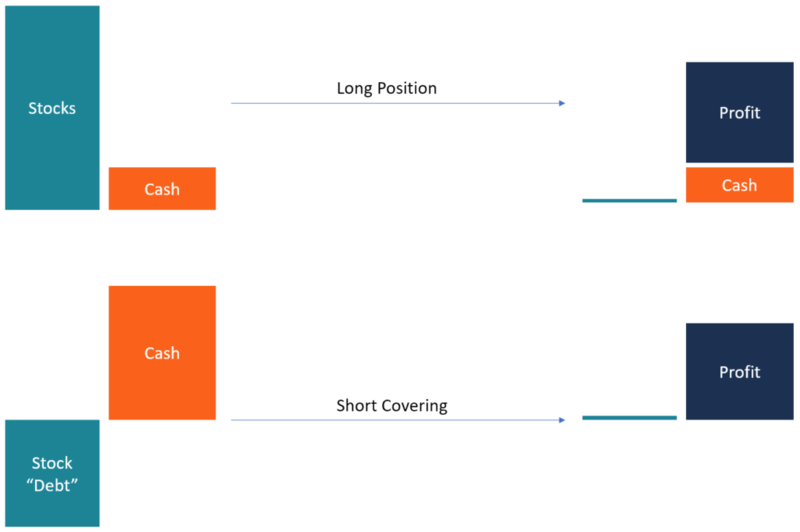 Below is the comparison between the short covering and short squeezing. In short covering, traders rush to open short position to make profits, while in short squeezing, traders rush to exit before making more losses. In short covering, traders buy to cover, while in short squeezing, traders sell to close their short positions. In short covering, a trader sees an opportunity for profits, while in short squeezing, a trader’s investment is facing threats. Using Joe’s investment, let’s assume that after the first month, stock prices start moving in the opposite direction. Instead of the price going down, it starts rising by 12% per day. Apparently, Joe and other traders will rush to close their short position before they make more losses. So, they will be squeezed out of the trade. Short squeezing leads to losses. However, a trader can determine whether an investment will result in losses or profits. It is done by evaluating the proportion of the shares sold versus total outstanding shares. The percentage is known as shares short interest. The other measure is the short interest ratio (SIR), which is the proportion of the shares sold versus the volume of the daily traded stocks. Unlike ordinary shareholders who can hold their stocks longer with the expectation that prices will rise, short covering usually anticipates changes in share prices in the opposite direction. As a result, they cause havoc in the market, leading to either sharp decline or steady gains in prices. Either way, it is not a desirable outcome for other stockholders who want a stable trading environment.